SHAUN Wane has no plans to add an assistant coach to his staff during this off-season. Warriors didn’t replace Paul Deacon when he left to join Sale Sharks in July. At the time, Wane said they would progress until the end of the season without a replacement. His other assistant, John Winder, and head of youth Matty Peet took on more duties as they guided the Warriors to a third successive Grand Final. And while Wane has not ruled out an addition before they return for pre-season training next month, he is content with the current staff. Sean O’Loughlin has already been taking on coaching duties with younger players. 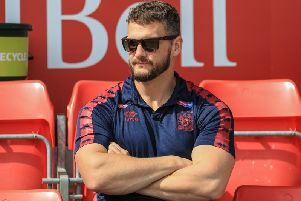 He has a deal with Wigan which sees him move onto the coaching staff once he hangs up his boots – though the 32-year-old has yet to put a date on when he may call it quits. The Warriors players who are not involved in the autumn internationals will report back for pre-season training in mid-November. Organisers have seen a surge of interest from fans in Wigan after Steve McNamara named five Wigan players – including uncapped trio George Burgess, John Bateman and Joe Burgess – in his squad to take on France tomorrow. Tickets for the non-televised Test at Leigh Sports Village cost just £10 adults and £5 juniors, and kick-off is 2pm.